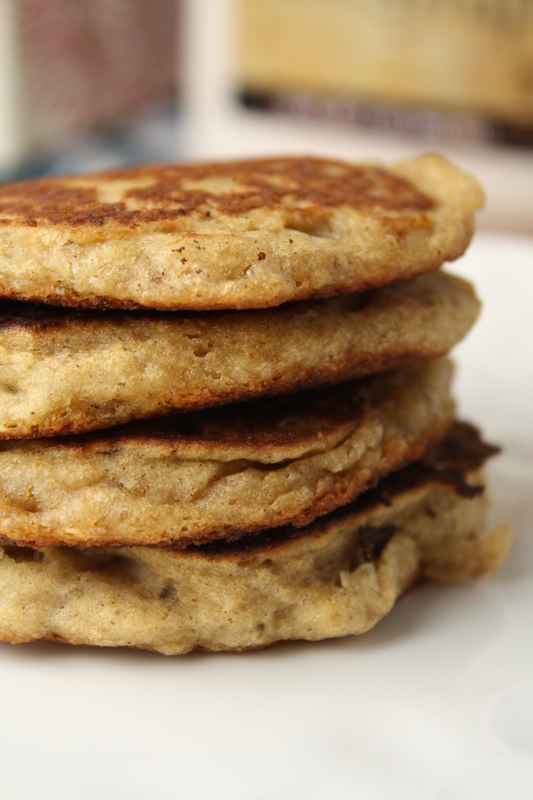 These gluten free wholegrain pancakes are a hearty and nourishing way to start off your day!! With no eggs and dairy, they are great for all types of restricted diets! I have a lot of pancake recipes on this blog. Why? I find it is one THE easiest ways for me to feed my family well, AND quite easily. My goal is to always maintain as nutritious of a profile as possible, and these pancakes are no exception . This recipe was adapted from one I found in Hallie Klecker’s “The Pure Kitchen” to make them nut and egg free for my son. I recently checked this book out at the library and have been thrilled with every single recipe I have made so far. Free of gluten, dairy, and refined sugars, Hallie and I cook a lot alike. Her book is definitely one that I will be getting for my very selective cookbook library (if I am not careful, my collection would be ridiculous…I truly love cookbooks and read them for pleasure)! If you haven’t yet, you should try this cookbook, it is excellent! These pancakes are light, fluffy, and have a lovely crunchy exterior. Definitely one worthy of our pancake recipe rotation! Bon appetit! Don’t forget extra pancakes store great in the freezer for busy school mornings. Re-heat in the microwave or toaster. I have a frugal, lower sugar pancake topping to help save some moola on that pricey maple syrup, and minimize the sugar in the topping! In a large measuring cup (for easy pancake pouring! ), whisk the wet ingredients together. Sprinkle the dry ingredients, in order, on top of the wet. Whisk in gently with the wet to incorporate. Swirl preferred oil (I used coconut oil) in the pan. Drop 2-3 tablespoons of batter in circles. When the top is filled with little bubbles, it is time to flip! Cook for an additional 1-2 minutes, enjoy! The flavor of these were amazing. I didn’t have chia meal so just ground up some chia seeds but made pancakes too thick. I’m assuming you can’t substitute tbsp. for tbsp.? After thinning the batter out thought they were delish! Hi Lori! Glad,you liked them! A whole tablespoon of chia seeds is more,like 2 tablespoons chia meal, but you. d your problem perfectly! Thanks,for commenting! Your pancakes look so tasty. Thanks for sharing on Real Food Fridays. Pinned & twitted. These look amazing! This recipe is one of the few I’ve found hat accommodates my husband’s food allergies – yay! These are mouth watering!! Thanks for linking them up at Gluten Free Fridays! Teff is a very UNDER USED flour! I have a feeling in a couple of years it will be as popular as coconut flour! These look great! I’ve got them printed and ready to make for my 4 year old. 🙂 I gotta get some teff flour. Hi Jenny! We love pancakes, i have seven pancake/waffle recipes on my blog that we rotate through! This looks very delicious and seems to be just perfect for sundy mornings in bed! I was excited to try this recipe this morning. It looks delicious and has great reviews. Ours turned out mushy, and I could not for the life of me figure out how to get them cooked all the way through. They were just super gooey, no matter how long I left them on the griddle. I used flaxseed meal instead of chia, and used cream of tartar and baking soda–my usual substitution for baking powder. Any idea what may have gone wrong? Yes, I agree, gooey is not good Mary Jo! How much flax did you use? Is your baking soda fresh? Maybe try less liquid? Or an egg instead of flax…..not sure of your diet…. Gooey = moisture, so reducing the liquid might work for you. These look delicious!!! Thank you so much for sharing! I love pancakes :). Your pancakes sound so wholesome and delicious! I like that they can be made ahead and frozen too. I love pancakes. These look very yummy! My daughter is asking for them again this morning! Enjoy! I’ve tried many pancake recipes since being GF for the past 4 years and I’ve finally found one I really like…these are wonderful! I used Millet and Sorghum flour this time, but will sub almond next time. Thanks for this recipe! Yahoo Steph, 4 years is a long time to go without a really good pancake…I am glad this one works for you! It was another one of those “Oh cr*p – it’s 5:00 – what do I make for dinner” nights. This is usually when I pull out the breakfast for dinner card. So glad I found my way back to your site when I googled whole grain gluten free pancakes! I whipped these up – super easy recipe (now that I’m stocked in teff flour!) and they were really delicious especially with the strawberry topping recipe. Thanks for saving the night Tessa! I have never tried the sparki.ing water route, but have always wanted too…thanks for reminding me and stopping by to comment! This recipe sounds fantastic. Can’t wait to try it this weekend. Pinned! Tessa, I was just visiting another site that had a recipe for waffles. I never seem to have much luck with making pancakes/waffles GF and allergy free. My centers never seem to get done enough and always doughy. My children love both and eat them anyway, but I wish I could get them to done all the way through without burning the outside ☺ I’m going to give your recipe a try! Thanks for sharing this week. Mary – Sounds like your heat is too high. If they don’t work out, let me know Mary, we will trouble shoot! These look so fluffy. I honestly would love some, right now. Maybe, pancakes would be good for dinner, tonight. Hmmmm. Pancakes are ALWAYS good for dinner Chaya!! They look lovely and I just need to get some teff flour to give these a go. Drooling over these pancakes. I can almost taste them just looking at those pictures. Thanks for always inspiring me with your healthy and delicious pancake recipes friend! Poor man AMber, how does he ever manage?! (; Enjoy!! Heather…several options. Teff flour is worth getting your hands on, either teff co, or amazon, or iherb are all good choices online. You could also ask you local store to see if they special order for you if they don’t have it. You could also replace the flour, see other comments for lots of options! These look delicious. What kind of oat flour do you buy? Or do you grind your own flour? 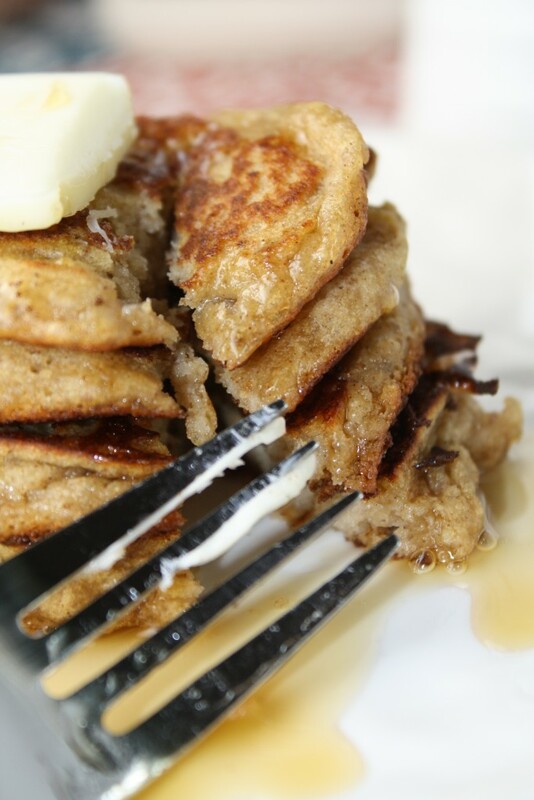 Gina, I have used Bob’s Red Mill GF Oat FLour, but more commonly I use grind my own using Trader Joes GF oats! TJs has GF oats?! mind blown. Indeed they do Jen….it will be great when they start carrying more things too! Hi, I saw this post on pintrest. They look wonderful! I was wondering if you could suggest something to use in place of the oats. I cannot have oats in addition to gluten. Do you think buckwheat groats or buckwheat flour would work? Thank you for the lovely looking pancake recipe. Cassandra, raw buckwheat groats would definitely work, so would sorghum, brown rice, millet, almond…..all of them will have a different flavor, so choose a personal favorite! could i use sorghum instead of teff? its really pricey here in NZ and there is not alot of it around. thanks for sharing your recipes on facebook because there are so many that i havent had the chance to find by looking on your site but these little photo links are great to source new recipes. will try these ASAP! Every flour will change the flavor and texture, but pancakes are very flexible! I post all my recipes on facebook, and twitter, and pinterest….with facebook’s new set-up, who knows WHICH updates you will see!!? ?